Look for an email from "FaithGateway" with the downloads and confirmation. If you don't see the email, check your spam/junk folder and add newsletter@e.faithgateway.com to your contacts. Question: What Else Do I Need? Your access to all 6 study videos will be FREE from our friends at Study Gateway, but the resource to go along with the videos is The Longing In Me Study Guide, which has your weekly study questions (workbook-style) for Weeks 2-6. Normally the full-retail price of the study guide is $12.99, but we have an exclusive coupon code for our Bible study participants. SAVE $5 OFF at Store.FaithGateway.com with coupon code SHEILA5. This coupon can be used on the study guide, hardcover book, and DVD if you need access to the videos offline. Buy all 3 and save $15 total! Don't wait... purchase the resources you need today with our special discount! This offer ends soon. PDF download of the first chapter of the book. PDF download of discussion questions and personal study pages for session one of the video Bible study. You can get a jump start on this study right away! Go ahead and watch session one with Sheila! Weeks 2-6 videos will be available for FREE on Study Gateway after April 10, but please note that there is one small change with this OBS. We will be unlocking the individual sessions week-by-week to help everyone stay on schedule with the official OBS! Each session's video will be available for free for one week during our study. Where do I sign up for the Facebook private group? What's that all about? Join here: https://www.facebook.com/groups/faithgatewayobs as a way to engage with other participants in the study! This is the place for people who want more daily interaction and community. Be sure to read the community rules and remember to keep conversations on topic with no soliciting. We’d love to have you be a part of this group! What other ways can we engage with the online participants? Every Thursday night during our study we have live online chats from 9-10 p.m. EST (6-7 p.m. PST) where we go through each week’s study questions and talk about the video lesson. These are hosted by a moderator/small group leader and are FREE for all participants. Yes! The videos that are on the DVDs are the same videos as what will appear online via Study Gateway. This is a nice option if you’re in a traditional church setting and don’t have an Internet connection, or if you want to do the study later and go at your own pace! Anyone with Internet access can watch the videos for FREE and follow along with our weekly emails. For the companion book or study guide, we recommend checking with your local Christian bookstore or online retailer (like Amazon Canada or Amazon UK). After sign up you’ll receive an email a week as you’re going through the study. We’ll keep you updated on the assigned reading for the week and where to watch your companion videos. With your registration you will also start to receive the FaithGateway Women’s newsletter – delivery twice/week and our weekly Deals email. You can unsubscribe from any of these at any time. Absolutely! The weekly videos will be available online via Study Gateway so you could get on Skype (or Google Hangouts, iChat, or whatever), watch them at the same time, then talk and process through the questions and each week’s reading together. We love this idea! What an awesome way to bond with friends across the miles. 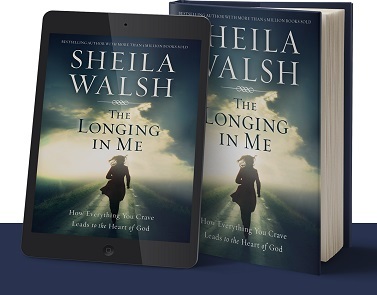 Everyone and anyone is welcome to join The Longing In Me online Bible study. Sheila’s studies appeal to women (and she calls out to her “girlfriends” a lot in her videos!) but the Scriptural truths and study of God’s Word are for everyone. Share The Longing In Me online study on social media and be sure to invite your friends! We hope you will consider starting a small group, recommending this study to your church's women's ministry, or leading other women through the study right from your home! Of course, if you're on your own you can do the study each week with the community of online women too! We give you all the FREE tools you need to get started.